All Saints’ isn’t the end for many of their football players. Every year alumni take on the next level of play, college football. Former All Saints’ athletes came out with a bang during the first two weeks of the 2015 season. Several All Saints’ alumni shed their redshirts this year. Ford Corbett, Cannon Maki, and Blaze Moorhead are officially active. Corbett played running back and safety for the Saints, and he now plays safety for the Rice Owls. Corbett was one of the 12 All Saints’ seniors who chose to play college football, and it was a good choice as he has played in the Owls’ last two games. Maki is with the Mean Green after completing his senior season in 2013 for the Saints. During his senior season, Maki was selected as defensive player of the game against Houston Christian, so he is one to keep an eye on during his redshirt-freshman season at fullback. Moorhead wasn’t exactly shedding a redshirt; however, he was putting his greyshirt season behind him. Moorhead is now able to take the field for UTSA at wide receiver. Two other Saints coming out of their redshirt season include Demetrius Knox and Kendall Adams. Knox was a 4-star recruit coming out of his senior season in 2013. 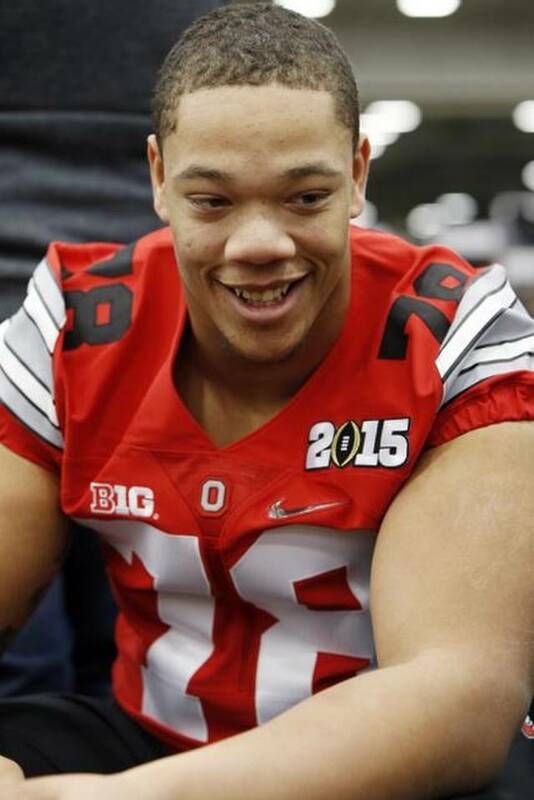 Knox had one of the best redshirt seasons one could ask for as his team, the Ohio St. Buckeyes, won the first National Championship under the College Football Playoff. Knox will be a big name to watch for at offensive guard over the next four years, especially during the 2015 season, as the Buckeyes are going into week 3 still ranked #1. Adams graduated All Saints’ with two state championships under his belt and a Kansas State scholarship in hand. Adams is someone to keep an eye on as well as he starts to see playing time for the Kansas State Wildcats. During K-State’s opening game against South Dakota, Adams took down his first two stats in the wildcat books with two solo tackles. Blake Hollenbeck and Jordan Keaton are a dynamic-duo down at Austin College. Hollenbeck and Keaton happen to play on two different sides of the ball; however, both have had the opportunity to step inside the hashes during the first two games for the Roos. Hollenbeck has yet to have a chance to prove himself during a game at wide receiver, but Keaton made the stat book during the Roos’ second game of the season. Keaton currently has two solo tackles and two assists. It’s time to bring the alumni celebration back home to Fort Worth with Foster Sawyer, Charlie Reid, and Jonathan Song. These athletes have three things in common: they’re All Saints’ alumni, they play for the TCU Horned Frogs, and they played for the Horned Frogs during their most recent win against Stephen F. Austin. Sophomore Charlie Reid has seen playing time before, but one of his “most-memorable” receptions came during the SFA game when he caught Foster Sawyer’s first collegiate pass for 4-yrds. Sawyer was put in for his first drive this past weekend after redshirting during the 2014 season. The drive was a long one, but it ended with Sawyer’s first 7 points and a memorable experience with Reid. Sawyer is currently sitting in the 3rd-string quarterback slot behind teammates Trevone Boykin and Bram Kohlhausen. 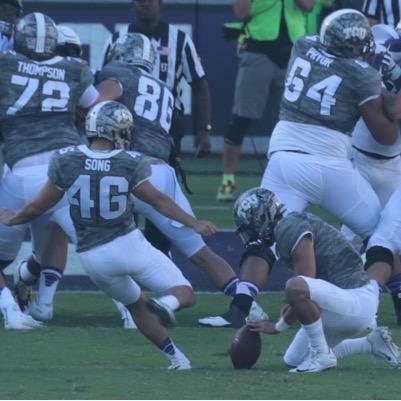 Recent graduate Jonathan Song, also saw playing time during the SFA game by taking two kickoffs and an extra point for the Frogs. Song is currently 2nd-string kicker behind Jaden Oberkrom. These three will likely get a lot more playing time in the coming years considering Boykin, Kohlhausen, and Oberkrom are seniors this year. This week, All Saints’ alumni are going into week 3 looking strong. Be sure to keep an eye out for former Saints as they take over college football. September 19, 2015 in All Saints' Life, All Saints' Sports, Sports.